e-Government has become an inherent aspect of the modernization of public administration all over the world. Increased use of information and communication technologies (ICTs) has created a new channel of the interaction and communication between government and citizens, which is supposed to increase transparency, responsiveness and the utilization of local potential in governance and policy processes. How this potential translates into practice depends on context. The key question is whether ICT itself is able to change the way government interacts with citizens through overall informatization of society, or would it be more proper to understand the new technologies only as a tool that can be manipulated by governments and even used to maintain the power of the elite of society in an increasingly complex environment. In this article we approach this issue by analyzing the communicational aspect of e-government in Bangladesh. We will analyze the e-government strategy and strategy-making process of the government, paying special attention to how it addresses the use of ICTs in facilitating interaction and communication between government and citizens. As a special instance of such a communication we focus on the national Web portal of Bangladesh. Our analysis will reveal how general theories and technological opportunities translate into realities in a developing country context. Bangladesh Country Gateway, (2002). E-readiness and need assessment. Retrieved January 31, 2013, from http://www.sdnbd.org/sdi/issues/IT-computer/ereadiness-BCG.pdf. Hanna, N. K. (2009). e-Government in developing countries. Information Policy, 2009.01.13. Retrieved February 20, 2013, from http://www.i-policy.org/2009/01/egovernment-in-developing-countries.html. Manthan Award South Asia, (2009). Retrieved January 31, 2013, from http://manthanaward.org/section_full_story.asp?id=867. Michel, H. (2005). 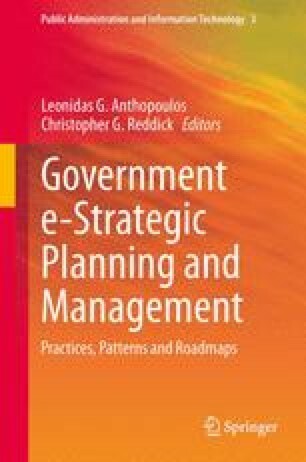 E-administration, e-government, e-governance and the learning city: A typology of citizenship management using ICTs. The Electronic Journal of e-Government, 3(4), 213–218. Retrieved November 20, 2007, from www.ejeg.com. National ICT Roadmap/Action Plan, (2008). Support for development of public sector use of ICT under—EMTAP project. Ministry of Science and ICT, Bangladesh. (for details see: http://www.korea-bangla.com/ict/ict_roadmap.pdf). Raman, V. (2008). Examining the ‘e’ in government and governance: A case study in alternatives from Bangalore City, India. The Journal of Community Informatics, 4. Retrieved May 2, 2013, from http://ci-journal.net/index.php/ciej/article/view/437/405. Star Business Report, (2013, February 26). ICT Roadmap Being Prepares. The Daily Star. For details see: http://www.thedailystar.net/newDesign/news-details.php?nid=39477. UNDP Bangladesh, (2008). e-Governance and Development Project: Quarterly Progress Report (January-March 2008). UNDP Bangladesh. Retrieved May 2, 2013, from http://www.undp.org.bd/projects/prodocs/A2I/QPR-2008__jan-mar__e-gov-dev.pdf. Undpegov (n.d.), (2013). Bangladesh. Retrieved January 31, 2013, from https://www.undpegov.org/sites/undpegov.org/files/articles/Bangladesh_Print_0.pdf. UNDPEPA, (2002). Benchmarking e-government—A global perspective. Retrieved February 17, 2005, from http://unpan1.un.org/intradoc/groups/public/documents/un/unpan008626.pdf. United Nations, (2012). Executive summary. Retrieved February 1, 2013, from http://unpan1.un.org/intradoc/groups/public/documents/un-dpadm/unpan048579.pdf. West, D. M. (2006). Global e-government, 2006. Retrieved May 2, 2013, from http://www.insidepolitics.org/egovt06int.pdf. West, D. M. (2008). Improving Technology Utilization in Electronic Government around the World, 2008. Governance studies at Brookings. Washington, D.C.: Brookings Institute. Retrieved May 1, 2013, from http://www.brookings.edu/~/media/research/files/reports/2008/8/17%20egovernment%20west/0817_egovernment_west.pdf.